For several years, front-loading washing machines have been the best choice for laundry rooms, offering better cleaning and higher efficiency than top-loading machines. However, top-loaders remain popular because they are more convenient (no bending down to load and unload the machine) and because front-loaders have a couple of persistent flaws. The industry has also tried to level the playing field with better, more efficient top-loading washing machines. It’s time to revisit the old front load vs top load faceoff, with the new high-efficiency models joining Team Top Load. We compare the price, efficiency, performance and convenience of front load vs top load machines. A small, no-frills top-load washer will set you back about $300. The cheapest front-loading machines cost at least $200 more. Another $50 will get you into a high-efficiency top-loading machine. These work more like front-loaders, cycling clothes through a partially filled tub of water instead of using a large central agitator to slosh clothes around a full tub. However, as we’ll explain in more detail below, the front-loaders are the cheapest to operate, using the smallest amounts of water and energy. By some estimates, a front-loading washer can save $100 per year on utility bills compared to a traditional top-loader. Front-loading machines may also save money in smaller ways. Clothes should last longer when washed in front-loading machines than they would in traditional top-loaders. The front-loaders also use less detergent, but this might not translate to monetary savings because low-suds detergent for high-efficiency washers often costs more than standard detergent. As noted above, front-loading washing machines are more energy- and water-efficient than traditional top-loading machines. Of 190 Energy Star-approved washers, only a handful are top-loaders, and even these specially designed high-efficiency models fall behind the front-loading models for energy and water usage. The most efficient washer, according to the Department of Energy, is a Whirlpool front-loader with 5 cubic feet of capacity (the Energy Star table lists 4.33 cubic feet of capacity, but every brand seems to round up generously with capacity ratings). It uses 114 kilowatt-hours (kWh) of electricity per year, making it 165 percent more efficient than the federal standard. The best top loaders are only 90 percent more efficient than the federal standard. Kenmore makes a smaller 3.7 cubic foot washing machine that uses 128 kWh per year. The front-loaders also provide substantial secondary energy savings by using less water and spinning more water out of clothes, requiring shorter, less energy-intensive drying cycles. On average, front-loaders reduce water use by about 40 percent, according to TXU Energy, a Texas utility with a Texas-sized online library of energy information. TXU estimates that the average family could save about 7,000 gallons of water per year by replacing an inefficient top-loader. Heating 7,000 gallons of water also requires significant amounts of power. According to Energy Star, the Whirlpool front-loader uses 2.7 gallons of water per cubic foot in each washing cycle. This is also the highest available efficiency. The Kenmore top-loader uses 3.9 gallons of water per cubic foot. For a Department of Energy study, 204 families in a Kansas town replaced their old-fashioned washers with front-loading machines. They saved 38 percent on water usage, and 56 percent on energy for the washer and its hot water. High-efficiency machines, both front- and top-loading, may not seem so efficient. They typically have much longer wash cycles (up to 115 minutes) than traditional washing machines (as short as 35 minutes). However, they operate differently and draw less power. They also use high-pressure rinses to get soap out of clothes rather than a tub full of rinse water, and sensors to customize water levels to the amount of clothes in the machines. Of course, it would be hard to justify the additional cost of front-loaders, and the efficiencies would be meaningless if your clothes didn’t get clean. However, Consumer Reports and other groups give front-loading washing machines top marks for performance. Despite all their drawbacks, top-loading washing machines earn points for convenience. They are easier to load and unload without kneeling down and reaching into the machine. Also, you can add clothes to traditional top-loading machines during the wash cycle. On front-loaders, the door locks to keep from spilling water on the floor. Front-loading machines are also less likely to become unbalanced and interrupt the wash cycle. They are ideal if space is at a premium because they can be stacked with dryers. Full-size models also have large, open tubs that will fit comforters and other large items that don’t fit around the bulky agitator. The biggest complaints about front-loading washing machines concern vibration noise and mold. Some front-loaders have such a fast spin cycle that it shakes the floor, and the machine might vibrate across the floor. While this is merely annoying, the potential for mold buildup is dangerous. Flexible rubber gaskets between the tub and the door help make the machine water-tight, but they may also collect lint, dirt and water, creating an ideal breeding ground for unhealthy mold, mildew and nasty smells. Mold problems have prompted class-action lawsuits against several manufacturers. There are plenty of remedies, but they all require additional attention and maintenance that wasn’t required for old top-loading machines. For example, you can wipe out the gaskets with bleach solutions or run an occasional empty disinfecting bleach cycle. Top-loaders win on convenience and initial cost, but the efficiency and performance awards go to front-loading washers. The front-loaders’ inconveniences should not be deal-breakers, and utility bill savings should quickly exceed the initial costs savings. Also look for state and local rebates on front-loading washers and energy-efficient top-loaders. 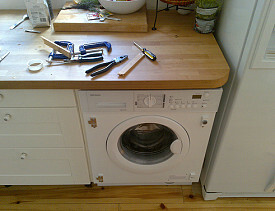 For help installing your new washing machine -- whether front-loading or top-loading, hire a reliable handyman.